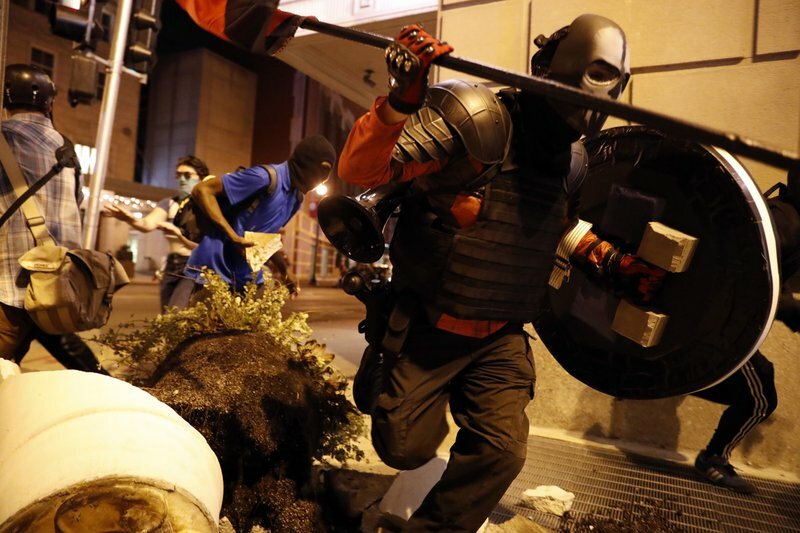 People run after vandalizing as demonstrators march in response to a not guilty verdict in the trial of former St. Louis police officer Jason Stockley, Sunday, Sept. 17, 2017, in St. Louis. Police made dozens of arrests in downtown St. Louis when people ignored orders to disperse after a third night of vandalism that followed largely nonviolent daylight protests. Police had warned those still on downtown streets late Sunday that they would be arrested if they didn’t leave the area. Sunday’s protest began at the police headquarters downtown. Following the same pattern of the previous days, well over 1,000 people marched peacefully for several hours in the afternoon and early evening. By nightfall, most had gone home. The 100 or so demonstrators who remained grew increasingly agitated as they marched toward the core of downtown. Along the way, they began to knock over planters, broke windows at a few shops and hotels, scattered plastic chairs at an outdoor venue.